With the end of summer approaching (sob! ), few things are certain: the leaves will change, the wind will take on a crisp bite and food manufacturers will start stuffing pumpkin spice into EVERYTHING they can think of, from potato chips to vodka. Of these pumpkin-flavored food items, Starbuck's Pumpkin Spice Latte continues to rank among the most popular, even though no one — Starbucks included — seems to understand what's really in it. Well, we know there's no pumpkin in it. "Pumpkin spice" is just a fancy, shortened name for the nutmeg, cinnamon and clove mixture that gives food that special autumnal zest. But while that's kind of a given, you'd think the rest of the ingredients in a latte would be fairly straight-forward. Not so! Investigative food blogger Vani Hari (a.k.a the Food Babe) recently sought out the ingredients to Starbuck's most popular seasonal drink and was given a complete run-around by the corporation. 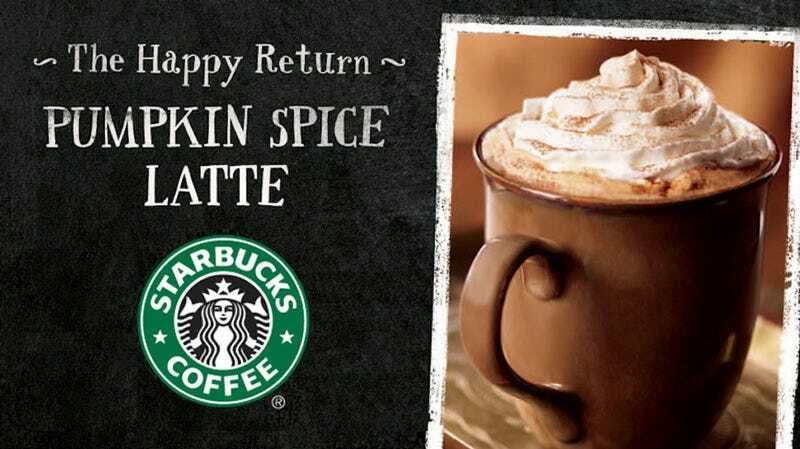 "The Pumpkin Spice Latte is of pumpkin and traditional fall spice flavors combined with espresso and steamed milk, topped with whipped cream and pumpkin pie spice. If you ever have any questions or concerns in the future, please don't hesitate to get in touch." Hari pressed on, wanting to know a more specific information, and was practically stonewalled at every turn. "While we understand that some customers would like to know the nutrition information for their specific customized beverage, unfortunately we are unable to provide this level of detail for every beverage customization request. The beverage information that is available on Starbucks.com reflects the beverage offerings currently on our menu with the most common customization options." She couldn't even get an answer as to whether or not the "pumpkin spice sauce" used in drinks for flavoring contained high fructose corn syrup, with some reps saying it did and others saying that it was sweetened with condensed milk. "Yes the sauce that we sell online at www.starbucks.com is that same sauce that we use in our stores. I understand you concerns about high fructose corn syrup being used in the Sweentened Condensed Nonfat Milk. Please be aware that product information is provided to us by the suppliers who manufacture food and beverage items for Starbucks Coffee Company. Variations may exist due to periodic changes in formulations. While we attempt to provide product information that is as complete as possible, product changes or new product introductions may cause this information to become outdated or incomplete. Products may vary from location to location". Beyond the sweetener, Hari discovered that there are plenty ingredients in the Starbucks Pumpkin Spice Latte that are Really Quite Bad for You™. This includes Class IV Caramel Color, a common food additive that's being investigated by the FDA, is illegal in high doses and has been shown to increase the risk of lung cancer and leukemia in mice, regardless of dosage. On that note, here's a reminder that Starbucks has gotten in the fall spirit early this year, rolling out the Pumpkin Spice Latte on August 25. Happy autumn, everybody!